mikepasini.com | Photo Corners | Black & White & Red All Over? Black & White & Red All Over? So the old riddle went. Very old. When newspapers were black and white, not garish color things. And read all over, too. Coincidence? Black and white has been in the news. Not at CES (where self-driving vehicle and adolescence seem to have peeked simultaneously this year). But here waxing poetic over the Fujifilm X-Trans sensor and there advocating a monochrome-only camera. We're not going there, though. Either "there." It seems to us that the viewfinder of the old Nikon FM we chipped our teeth on did not display the scene in monochrome. Monochrome was an invisible limitation (or virtue) of the Tri-X we had loaded. We saw in color if we dreamed in black and white. There's no reason you can't do exactly the same thing today with whatever you are holding up as a camera. In fact, you can do a little better with any camera that saves Raw captures. That Raw file will record all the color data of the scene, of course. But if you save a monochrome JPEG with it, you can immediately see how the scene is rendered in black and white. So Raw+JPEG with a monochrome JPEG setting. That camera rendering is, of course, provisional. It won't mimic the oddities of various emulsions. Which bothers some people (who forget it's provisional). Control. 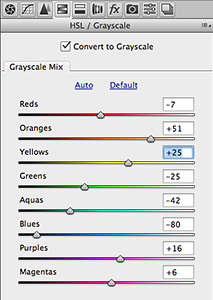 Change the value of any hue in a black and white image when your image file retains hue data. You certainly can mimic black and white emulsions with any image you've captured, though. You just need something like Alien Skin's Exposure 7, DxO FilmPack or Film Stocks from Digital Film Tools. And you can also free yourself from gravity using an image editor with sliders for the various hues in a color image. That's where the real fun resides. Take our example image, for example. It was fall. 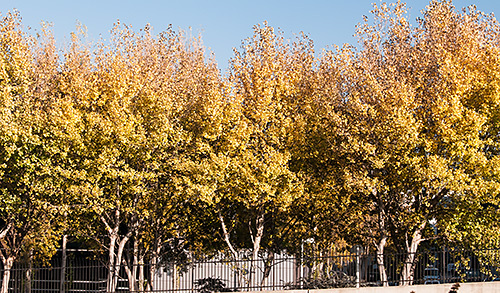 The leaves were turning color. We took our shot facing north. Pleasant enough. Then we got to thinking about a black and white rendering in which the leaves were white and the sky dark. That may remind you of something (like infrared) but it didn't actually remind us of anything. It was just a treatment we wanted to try. 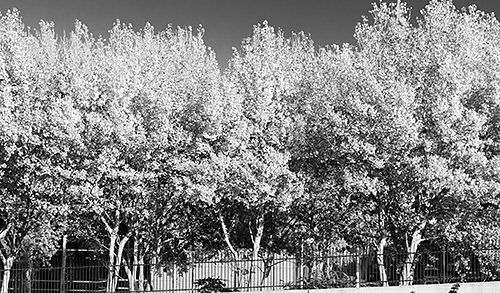 So we opened the DNG Raw file in Adobe Camera Raw, tweaked the color version (which we saved for comparison) and converted it to black and white. That got us those sliders. We pushed blue to the left to darken the sky. And we pushed Orange and Yellow to the right to lighten them up, playing around with various settings to maximize the contrast of the higher key rendering of the leaves. Piece of fruitcake. Which has red all over, incidentally.